Centipedegrass (Eremochloa ophiuroides) provides a warm-climate perennial groundcover. This dense, turf grass flourishes in many areas of the southern United States. Centipedegrass exhibits a slow pattern of growth, gradually spreading to form a dense turf. Landscapers and gardeners select this type of grass for its ability to adapt to various soils and low-maintenance requirements. Although recognized for its thick turf, some conditions cause centipede grass to appear thin and unhealthy. Thicken centipedegrass by providing regular, deep waterings and an annual fertilizer. Test your soil to determine its pH balance. Centipedegrass grows best in slightly acidic soils. The ideal pH range for centipedegrass is between 5.0 and 6.0. Purchase a test kit from your local gardening center or extension office to eliminate the possibility of nutrient deficiencies adversely affecting your centipedegrass. Add any nutrients recommended by the test results to adjust the soil composition. Cut away large branches from overhead trees. Centipedegrass requires sunny conditions to thicken and flourish. Use a branch saw to remove any low branches and thin out areas of the canopy to allow plenty of light to reach the lawn. Treat your centipedegrass with pesticides if you notice any evidence of bugs or worms. These pests damage the lawn, creating large areas of thinning grass and dead spots. Look closely at the individual blades of grass and the surface of the soil. Apply a pesticide if you notice any evidence of grass damage due to gnawing insects or notice any bugs, tiny worms or insect eggs around the roots or on the surface of the soil. Purchase a lawn pesticide for use on centipedegrass. Apply the pesticide according to the manufacturer’s instructions. Fertilize centipedegrass to encourage the formation of thick turf. Apply a nitrogen fertilizer once a year to improve the health of centipedegrass. 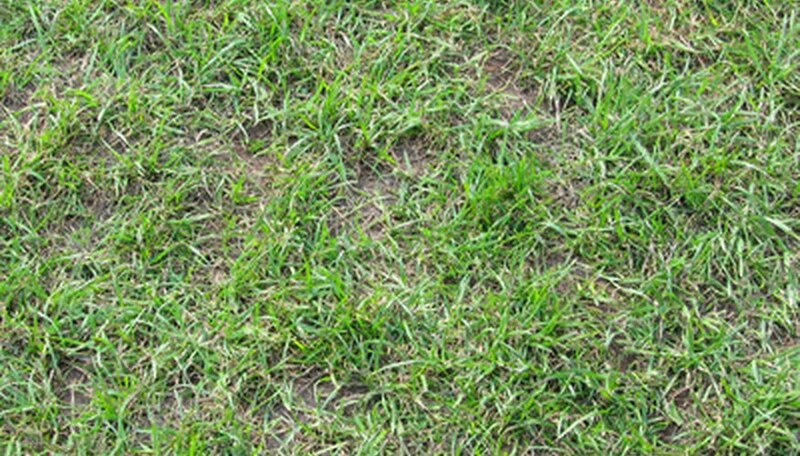 Fertilizing more than once a year may actually damage centipedegrass by providing a soil environment too rich for this low-maintenance grass. Water centipedegrass lawn regularly to thicken the growth. Do not allow this type of grass to suffer during arid conditions. The shallow roots require soaking the soil 4 to 6 inches deep to provide adequate moisture at the roots. Avoid frequent, shallow watering sessions by allowing the soil to dry between soakings. Centipedegrass grows slowly. Avoid applying excessive amounts of fertilizer in an attempt to grow this type of grass quickly. Too much fertilizer may damage centipedegrass.